The type of cell division in which number of chromosomes remains constant in the daughter cells as in the parent cells is called mitosis. Mitosis can take place in haploid and in diploid cells in all parts of the body. Mitosis is a continuous process It is divided into two phases i.e., karyokinesis, cytokinesis. The division of nucleus is called karyokinesis. The first step of the karyokinesis is the formation of mitotic apparatus. The specialized microtubule structure including aster and spindle is called mitotic apparatus. Following steps takes place during mitotic apparatus formation. I. The centrioles are duplicated during interphase. But both centrioles are present in the same centrosome. The partition of these centrioles takes place in the beginning of karyokinesis. Two pair of centrioles separate and migrate to opposite sides of the nucleus. They establish bipolarity of the dividing cells. 2. 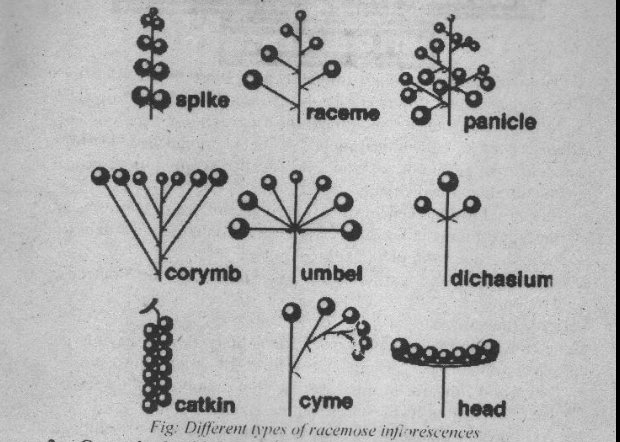 Sets of microtubules (fibers) originate from each pair of centrioles. These microtubules are composed of a protein tubulin and traces of RNA. (a) Astral microtubules: They radiates outward form aster. (i) Kinetochore microtubules: These microtubules attach to chromosomes at kinetochores. (ii) Polar microtubules: They do not interact with the chromosomes. Polar microtubules are arranged from. the opposite pole. Function of mitotic apparatus: The spindles of the mitotic apparatus are larger than the nucleus. These microtubules are used to attach and capture chromosomes. So they align the chromosome and finally separating them in such a way that equal distribution of chromosomes take place. Karyokinesis can further be divided into prophase, metaphase, anaphase and telophase. (a) The chromatin material is condensed by folding. Thus the chromosomes appear as thin threads (0.25 tm — 50 i.tin in length) at the beginning of prophase. chromosomes become visible. Each chromosome has two sister chromatids. These chromatids are attached at centromere. (c) The nuclear envelope disappears at the end of prophase and nuclear material is released in the cytoplasm. (e) Mitotic apparatus is organized. (f) Cytoplasm becomes more viscous. Each metaphase chromosome has duplicated structure. It consists of two sister chromatids. The chromatids are attached at a point called centromere or primary constriction. The centromere has special area called Kinetochore. Kinetochore has specific base arrangement and special proteins. The kinetochore fibers of mitotic apparatus attach at these kinetochore of the chromosome. the equator. Each kinetochore is attached with two fibers each from opposite poles. It is the most critical phase of the mitosis. It ensures equal distribution of chromatids in the daughter cells. The kinetochore fibers of spindle contract towards their respective poles. They exert force on the centromere and sister chromatids are separated from centromere. As a result, half of the sister chromatids travel towards each pole. At the same time polar microtubule elongates. The anaphase ends with the reaching of the chromosomes at opposite poles and telophase starts. The chromosomes unfold and decondense. They ultimately disappear as chromatin. Mitotic apparatus disorganize. The nuclear membrane and nucleoli reorganize. Thus two nuclei are formed at two poles of the cell. activates the actin and myosin. The actin and myosin form contractile ring. Their contraction forms cleavage furrow. The furrow deepens towards the center of the cells. It finally divides the parent cell into two daughter cells. 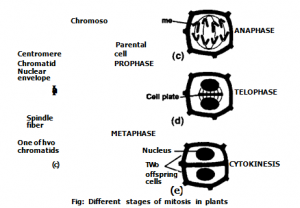 (b) Cytokinesis in plant cells: Plants do not form contractile ring during Cytokinesis. Membranous vesicles are collected in the centre. Membrane structure phragmoplast is formed from vesicles. These vesicles are originated from Golgi complex during metaphase. The vesicles line up in the center of the dividing cell. They finally fuse to form phragmoplast at the end of telophase. The membrane of vesicles becomes the plasma membrane of daughter cells. These vesicles also contain materials for future cell wall. These materials are in form of precursors of cellulose and pectin. spindle microtubule radiate from this region. 2. 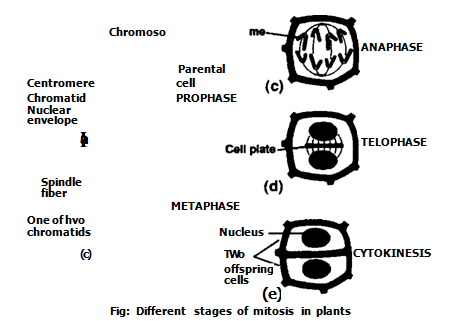 The shape of the cell change greatly during mitosis. The organisms require managed controlled and properly organized process of mitosis. Otherwise mitosis my result in malfunction. It may cause unwanted tumors and lethal diseases like cancer. There is following importance of mitosis. during mitosis. The crossing over or recombination does not take place during mitosis. 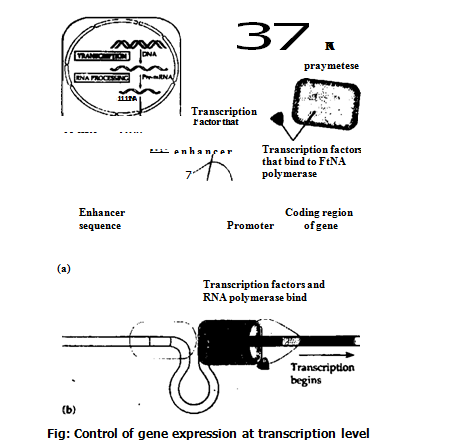 Thus the genetic information remains unchanged generation after generation. It ensures the continuity of similar information from pareht to daughter cell. Asexual reproduction in some organisms takes place by mitosis. Regeneration, healing of wounds and replacement of older cells also take place by mitosis. The development and growth of multicellular organisms depends on the orderly controlled mitosis. Tissue culture and cloning also require mitosis.